One of the most important parts of developing your “craft beer palate” is pairing beer with different foods. At time those pairings can lead to actually using beer in the dishes that you cook. One of my favorite ways to cook with craft beer is to make BBQ sauces. So far I have come up with three different Beer-BBQ sauces that after trial and error have been well liked by my family and friends. 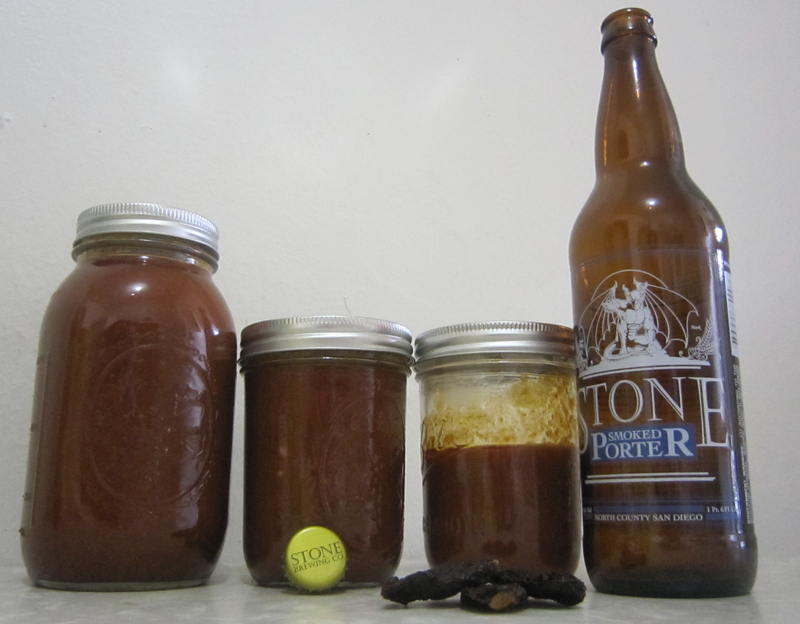 My Chipotle-Smoked Porter BBQ Sauce was the first beer barbeque sauce recipe that I came up with and the one that I make most often. Therefore, I chose to let you in on the recipe and preparation process. 1. Separate chipotle peppers into skins and seeds so you can add a little bit of each throughout the simmer. 2. Combine all ingredients in a pot (excluding the pepper seeds and skins). >> Adding 12oz of beer at this point. 3. Then as simmers on medium heat (for about 30 minutes) add the 4 remaining ounces of beer (or more if you so desire, I like to drink the rest as make the sauce). You can Also add more of the other ingredients to enhance taste to your preferences. 4. Pour some sauce into a bowl or measuring cup and add the corn starch. Mix until no clumps of corn starch are left. Then pour back into the pot and mix. 5. After you reach the amount of sweetness and spiciness that you prefer turn off the flame. Remember: The spiciness will increase after bottling and sitting in the fridge overnight. 6. After sauce cools for 15-20 minutes…Strain it to remove the pepper skins and use a funnel to bottle the sauce (I’d recommend using the empty ketchup bottle and any other empty clean condiment bottles you may have around). 7. Let the sauce sit overnight in the fridge to thicken and develop its full flavor. If you choose to make this sauce and have questions feel free to comment on this post or email me. This entry was posted in Cooking w/ Beer, Craft Beer Advocacy and tagged beer bbq sauce, chipotle peppers, Cooking with beer, craft beer, Greg Koch, Homebrew Chef, porter, Sean Paxton, smoked meat, Stone Brewing Company, Stone Smoked Porter, vanilla beans. Bookmark the permalink.